The Protagonist: Iolanthe, a.k.a. "Archer Fairfax." A mysterious orphan with the power to work all four magical elements. Her Angst: Since her country's Evil Overlords keep a sharp eye out for powerful mages they can enslave/destroy, she has to keep her own powers a secret. The Other Protagonist: Prince Titus. The ruler of the Domain in name only, he's organizing a secret rebellion to avenge his mother. The only thing missing from his plan is an Oblivious Empowered Orphan. His Angst: He's bent on organizing this rebellion and freeing his people from the cruel reign of Atlantis - all the while knowing (thanks to a prophesy) that it will result in his own death. Master Haywood: Iolanthe's cheating, stealing, lying drug-addicted guardian - but don't worry! He has a magical excuse for being A Terrible Person so it's all good! Kashkari: An Eton student from India who seems to know more than he lets on. Wintervale: An exile from the mage realm who's also a student at Eton with Prince Titus. The Bane: The High Commander of Atlantis - is supposedly 200 years old and impossible to be killed. The Inquisitor: The Evil Minion of the Bane who investigates possible rebellions. Man this chick is way hotter when she's dressed as a dude - should I be worried? The Word: Keep writing romances, Sherry Thomas. Your romance novels are some of the best I have ever read. Not Quite a Husband, Private Arrangements and Delicious are exquisite stories with gorgeous details and fantastic dialogue. Unfortunately, for some inexplicable reason Sherry Thomas' skills with detail, storytelling, and character building do not translate into Young Adult Fantasy. 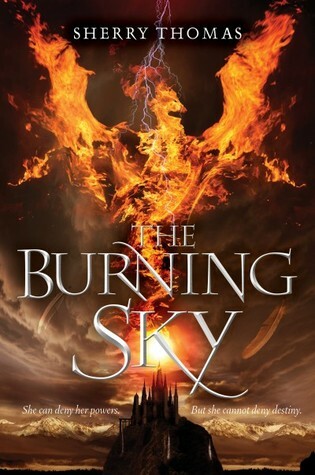 After reading about a hundred pages of her first YA effort, The Burning Sky, with all of its cliched tropes, bland character development, and utterly absurd worldbuilding, I had to start skimming. Our heroine, Iolanthe, is an Oblivious Empowered Orphan in a realm known simply as the Domain, currently under the cruel usurping thumb of Atlantis, an empire that likes to make mages who get a little too powerful disappear. Everyone in this world is familiar with elemental magic (wordless control of fire, air, etc.) and "subtle" magic (verbal spells using wands a la Harry Potter). Iolanthe, of course, has Way More Elemental Power than the average bear but, being an Oblivious Empowered Orphan (with a Destiny, no less! ), no one's willing to explain her powers to her in anything other than Meaningless Riddles. She's currently practicing minor magic in a small village with her inept, drug-addicted guardian, Master Haywood. When he ruins one of her potions because he's A Terrible Person, Iolanthe notices a scrawled note on her potion book that says a thunderbolt will make her potion as good as new. Now, despite the fact that she has no idea who wrote that note, no one in their Domain has been able to cast lightning in a thousand years, and the only one who did it is a figure from folklore, Iolanthe decides to try poking her finger at the sky and shouting "Lightning!" I'm dead serious. And it works. Because of course it does. Her magical lightning milkshake brings all the Evil Minions of Atlantis to the yard, and Iolanthe is barely rescued in time by Titus - the teenage Prince of the Domain. Rendered a powerless figurehead by Atlantis, Titus has been secretly scheming to topple their empire once he finds the Destined Oblivious Empowered Orphan. Now that he has her, he spirits her into the human world, where he disguises them both as male students at Eton. The rest of the novel plays out like a reverse-Harry Potter, with the magical students pretending to be normal in a famous British boarding school, as they try to dodge the spies of Atlantis and train Iolanthe to fulfill her Destiny as the World-Saver. Now, okay, I don't mind hoary fantasy cliches so long as the Oblivious Empowered Orphan is a developed and memorable character. Unfortunately, Iolanthe is a pert Mary Sue for much of the novel. Despite a haphazard and impoverished upbringing in a series of podunk towns, she is inexplicably flawless at pretending to be a boy at an upper-class all-boy's school, is a star player at cricket on the first try despite knowing nothing about the game, and, oh yeah, can call down lightning by poking her finger at the sky and asking for it. Titus, meanwhile, is a fairly bland Mentor with Mummy Issues. He spends most of the novel whining about his responsibilities and what a Duplicitous Angsty Trickster he has to be to outsmart the Atlantis spies and keep his secret rebellion a secret. Wash, Rinse, Repeat. The magical worldbuilding is similarly overly-convenient. There is no cost to doing magic, and no barriers or limitations to what it can do. It can hem sheets and cook food. It can predict the future. It can teleport people over hundreds of miles. As a result, whenever Iolanthe and Titus run into a problem, there's always a Handy Magical Item on hand for just about every occasion. Magical typewriters, magical Dead Mother Prophesy diaries, magical wardrobes. It makes it very difficult for the author to establish true stakes when magic is capable of just about everything. It also begs the question of why Atlantis doesn't just try taking over England and the human world, seeing as Thomas establishes how literally everything about Victorian England is inferior to the Domain - at one point, Titus worries that Iolanthe won't know what a salt shaker is because the food in the Domain is always perfectly salted. Really, truly. And on top of the by-the-numbers characters and nonsensical worldbuilding, the pacing is also fairly slow - lots of angsting and training and whining and Etonian hijinks from the other schoolboys. There is no real goal in this novel, apart from Not Getting Caught and Killed. Our characters spend the novel reacting instead of acting - and even the big climax is a reaction to the Bad Guys' initiative rather than any decision on the protagonists' part. While I am a long way from taking Sherry Thomas' romance novels off my autobuy list, I doubt I'll be continuing with this series. Fringe 1x19: "The Road Not Taken"